Sideshow Theatre Company, in conjunction with Boston’s Fresh Ink Theatre, presents a two-city rolling world premiere of CHALK. The world is coming to an end. 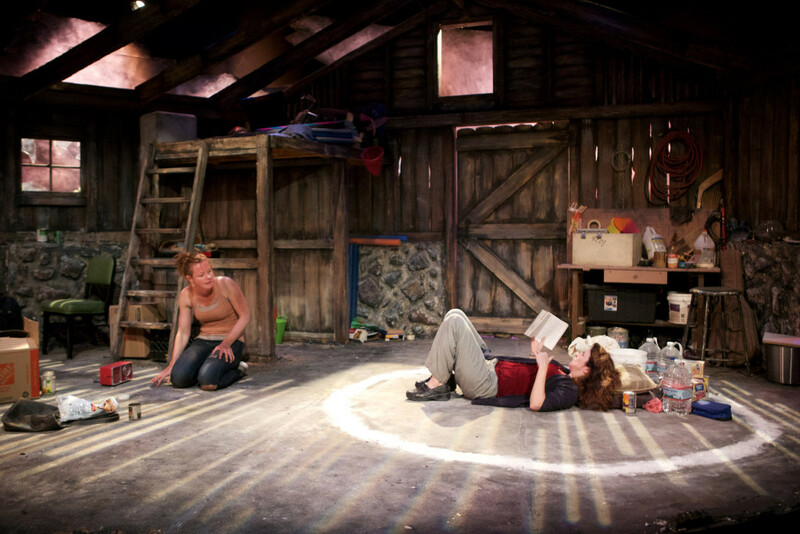 In an abandoned building, two women and an alien are separated by a circle of chalk. Playwright Walt McGough pens a homespun thriller. In the broader realm, a world invasion is leading to the extinction of the human race. In more personal terms, a mother and daughter grapple with their relationship. McGough throws us into the apocalypses, both Armegeddon doomsday and mother-daughter dysfunctional. The experience is a Sci-fi meets Lifetime channel original. Director Megan A. Smith skillfully balances the chaos with calm. The strong contrasts give the evolving tale a more unsettling vibe. Before the show even starts, the steadfast Kathleen Akerley (Maggie) is quietly sitting inside a chalk-lined circle. She has pillows, water, poptarts, a radio and a book. When the play starts, Nina O’Keefe (Cora) is sneaking into the barn trying not to disturb Akerley. She steps noisily and Akerley becomes aware of her. They lock eyes. The scene starts out like a curfew-breaking teenager getting caught by a disappointed parent. Akerley doesn’t say a word as O’Keefe overcompensates for the silence with rambling justifications for her prolonged absence. Akerley is unflappable. O’Keefe spirals out-of-control. McGough prophesies annihilation with unique specifics. He then neatly coils them in and around a mother-daughter’s struggling relationship. The apocalyptic fable is riveting. I’m uneasy by the tension caused by alien and daughter. The untiring O’Keefe eats and sputters with ongoing ferocity. As the daughter, O’Keefe gives us snippets of helplessness. Although I get that lump-in-the-throat over a mom trying to protect her kid, O’Keefe seems miscast. The age difference between O’Keefe and Akerley doesn’t appear to be enough to naturally establish parent-child roles. In addition, McGough has given the alien teenage characteristics. Casting a younger person as Cora would escalate conflict and deepen the audience’s emotional investment. Still, this CHALK is captivating. It draws a line around a mother’s love. And then gets us to continually wonder what needs to happen for Akerley to step out of her comfort zone.